Hit the Road: Why do Arizona’s saguaros disappear at the California border? It’s 9 a.m. on a September day in Quartzite, Arizona, and the temperature is already 100 degrees. This blip-of-a-town, about 20 miles east of the California border on Interstate 10, is the site of my usual break at my usual truck stop to buy my usual Dairy Queen Cappuccino MooLatte en route to Phoenix/Tempe. The MooLatte, a delicious coffee-and-ice cream concoction, always fuels me through the next third of my trip which ends in Indio. I began this west-east drive about four-and-a-half hours ago. This Quartzite pit stop is mandatory not only for refreshments but because it’s one of the first opportunities to buy gas for less than $3 a gallon after crossing the Colorado River. Back at the Dairy Queen counter, I order my MooLatte. “We’re out of ice cream,” the young woman behind the counter says matter-of-factly. “It hasn’t come in yet,” she explains, pointing to the soft-serve ice cream machine that I assumed could never run dry. This is not good; time for Plan B.
I head out into the stifling heat and across the inferno-of-a-parking lot to another fast food establishment. I’ll have to settle for a MooLatte substitute — a frozen coffee drink that is so sweet I can hardly swallow it, but it’s all I’ve got. I’ve driven this round-trip route to Tempe dozens of times over the past years: head east on Highway 78; north on Interstate 15; north on Interstate 215; east on highway 60 which eventually merges into Interstate 10, then straight on into the Valley of the Sun. Reverse the route when heading home. Many can do the one-way trip in less than six hours, but I’ve rarely cracked seven hours. Two hours in the car and I must move, so I divide the 400-mile trip into thirds. First leg: home to Jackson Street in Indio, where there’s an ample, uncrowded parking lot for walking, a McDonald’s with a remodeled restroom, and icy, sugar-free vanilla lattes. Middle leg: Indio to the aforementioned Quartzite for fuel, a walk and a Cappuccino MooLatte (when the ice cream has come in). Last leg: Quartzite to Tempe/Mesa, where I have multiple siblings. 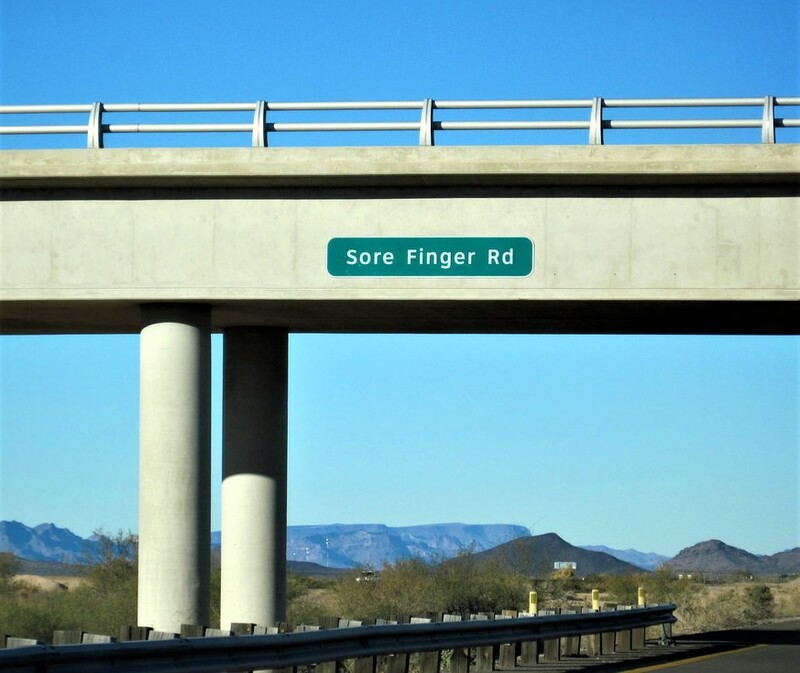 Who named Sore Finger Road (90 miles west of Phoenix) and why? 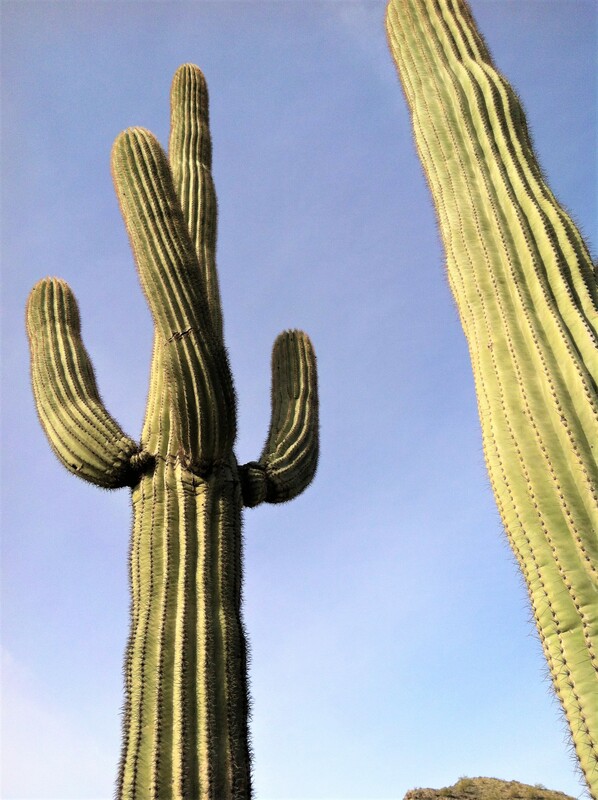 How is it that the stately saguaros stop growing right at the Arizona-California border? Can you really tell the difference between 112 degrees and 117 degrees? What does it feel like to be in the middle of a haboob? Actually, I learned the answer to that last question in July: It’s really windy and gritty and if you’re stupid enough to stay outside, you’ll likely get drenched, too.